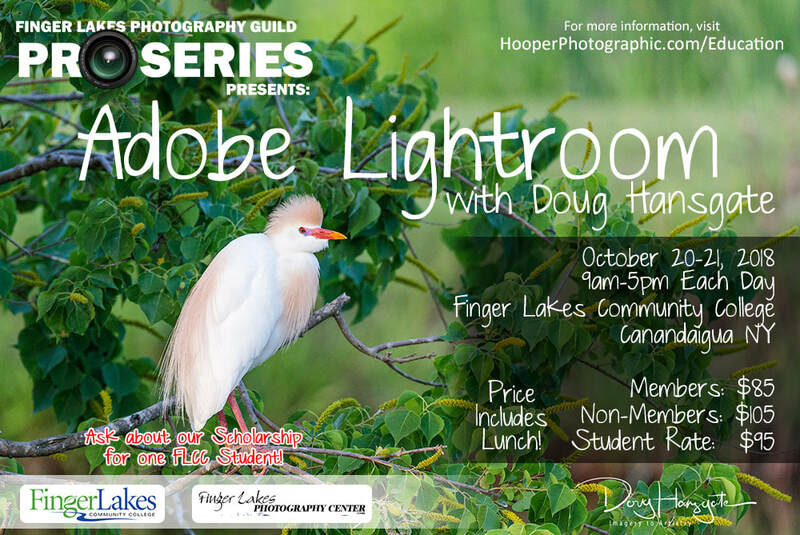 This workshop features nationally recognized Portrait and Landscape photographer, Doug Hansgate. If you are a photographer, you simply have to learn to be efficient in Lightroom — A program that was designed from the ground up to used by photographers. This is simply the best solution available for file management, efficiency and overall control of your images. This Lightroom™ class will teach you how to maximize your work-flow and create a systematic approach to all your digital imagery. There are systems that have been proven effective to rapidly and succinctly process large project shoots (weddings, etc.) into manageable client-based results. I’ll show you the shortcuts and methods that work. Take a journey of editing that will open your eyes to the true potential of Ligthroom™ editing, well beyond what most users ever dream of. Part of my Imagery to Artistry series this class is a favorite of attendees everywhere. Doug has been shooting professionally and with distinction for over 40 years. His creative approach to photography, coupled with his ability to see and capture light, permeates his impressive body of work. His love of photography, passion for art, and desire to always be the best that he can be in any field, has driven him to excel as a photographer, artist and educator, wood sculptor, master stonecutter, and fine art craftsman. Doug’s work has been on display in galleries in New York City, Washington DC Smithsonian, Buffalo, PA and Toronto, including the world-famous Ontario Art Gallery. His numerous gallery showings highlight his perceptive and compelling work. Doug is gifted in his ability to view a subject, see and distinguish slight nuances in light and tonal variations, capture that vision through photography and the capabilities of the camera, and express his vision through printed work. His work has been seen in dozens of magazines and throughout the web on commercial sites, and has received numerous national and international awards including the Kodak award for image excellence. His mainstay has been his commercial work with attorneys, real-estate developers, physicians, product developers, recording companies, modeling agencies including the prestigious Wihelmina Agency of New York and Silver Modeling agency of New York. As well as maintaining a high volume high school senior business and portraiture studio. Through his constant search for the very best technology, new techniques and tools, evolving styles, and an idealistic view of the world, Doug has become a sought-after educator. As a consummate instructor, Doug works hard to share his knowledge with fellow photographers. Photographers look to him to expand their knowledge, increase their sense of light, create that which the camera is incapable of perceiving, and explore the world as an artist. Doug has taught at professional photography seminars throughout the United States and Canada. He teaches classes in Adobe® Photoshop® and Lightroom®, post production applications, high dynamic range, painter, and studio portraiture. His passion for sharing his knowledge is tempered only by the hours of the day and how much can be accomplished in one lifetime. As you explore Doug’s work, you will surely see—and feel—the emotion and passion that he captures in every image, whether in his dreamscape series or iconic architectural images. As a sought-after judge of photographic imagery, Owner of AMP Studios, a successful commercial portrait and fashion photography studio in North Tonawanda, New York, Doug often says that if an image does not exude passion and does not evoke a sense of delight, sorrow, sadness, happiness, or desire, the image lacks the ability to be a sustainable work of art.